You know how sometimes life just seems effortless, and things just flow the way they're supposed to and you sort of seem wrapped in this sense of calm and certainty? Yeah, me neither. In fact, about the only thing I can say with certainty at the moment is that nothing seems effortless and there is definitely no flow happening here. Just one of those days. I think we all have them now and then and thankfully they tend to be short-lived. But while we're all waiting for my life to settle back into some semblance of normalcy, let's eat some mug cake! And what makes this so perfect for my life right now is that this cake takes no planning, about 1 minute to assemble, and another minute to cook. The bad news is that you have to wait like 5 minutes for it to cool down so you can actually eat it. But that's 5 minutes well spent, I will tell you, because this is one very tasty little mug of goodness. We've all seen the recipes for mug cakes, mug muffins and other mug kind of stuff being cooked in the microwave and I really like the idea of this because if you think about it, there's something very personal and satisfying about your own little cake that you can make in a couple of minutes and eat all by yourself. You know? This is all about you! Of course you can make several and share them, but that's entirely optional and dependent on the flow of your life at the moment. I just made one. 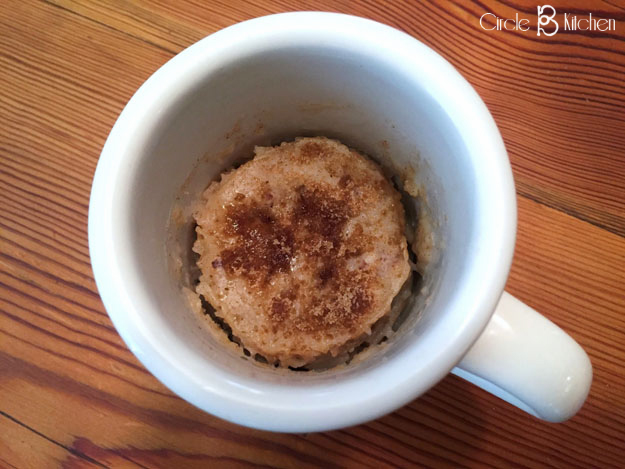 The idea for this particular mug cake came from a recipe I came across on the Kitchn website for an aptly named oatmeal mug cake. It was OK, but both the Husband and I thought it needed something so I went to work and added applesauce, raisins and a sprinkling of brown sugar on the top. The applesauce gave it some much needed moisture, a hint of apple-ness, and it also gave the cinnamon a true purpose in life. The brown sugar gave it sort of a caramel topping and the raisins were just because I love them, but you could leave them out. 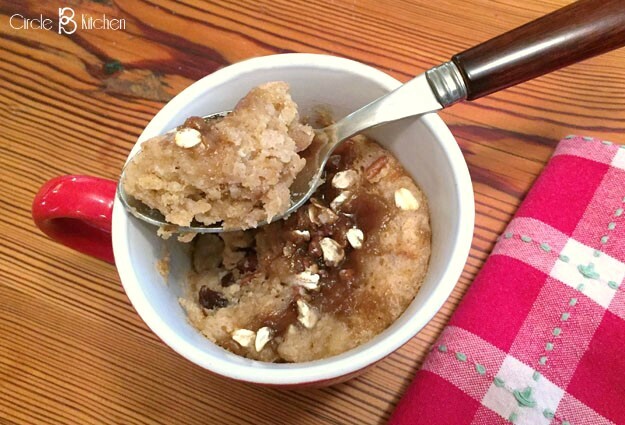 Mug cakes are lovely little things but they're also a little weird. You have to cook them in a mug that's big enough to hold in the cake as it cooks because it will really inflate. But then as it cools, it deflates quite a bit so that the final cake sort of looks lost in the mug. This is only a perceptual problem, because as soon as you taste it, you won't care how lost it might be. You will find it and eat it all. It's that good. Not terribly photogenic, but still super scrumptious. 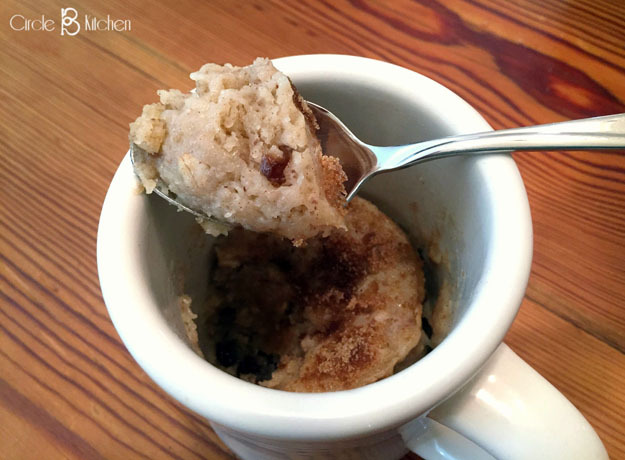 Possible applications for an oatmeal cinnamon mug cake would be a quick breakfast, a wonderful afternoon snack with your cup of tea, or a nice, light dessert in the evening. And how about mixing up the batter in the morning and taking it to work with you. Pretty nice idea to have a fresh little cake for your coffee break, huh? So the whole deal with mug cakes, muffins and the like is that your microwave is going to cook very differently from mine, so there’s a bit of variation to deal with. That being said, after you make the first one, you’ll get the hang of how long to cook yours. Remember that it will sort of keep cooking a little after you take it out of the oven, so don’t overcook it. If yours seems dried or overly cake-y, it got overcooked. It should be moist and scrumptious! Enjoy! 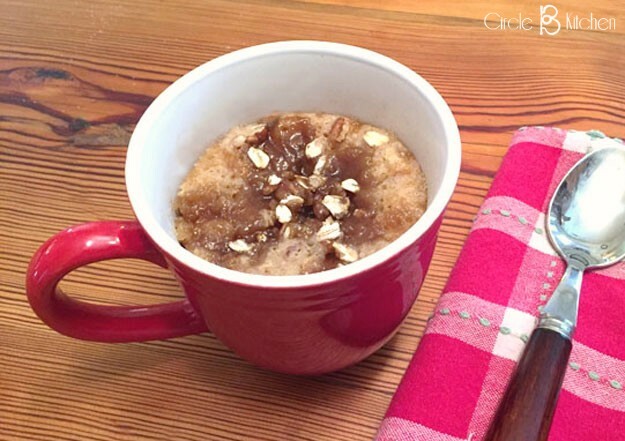 In a 12-ounce mug, whisk together the milk, olive oil, applesauce and sugar. 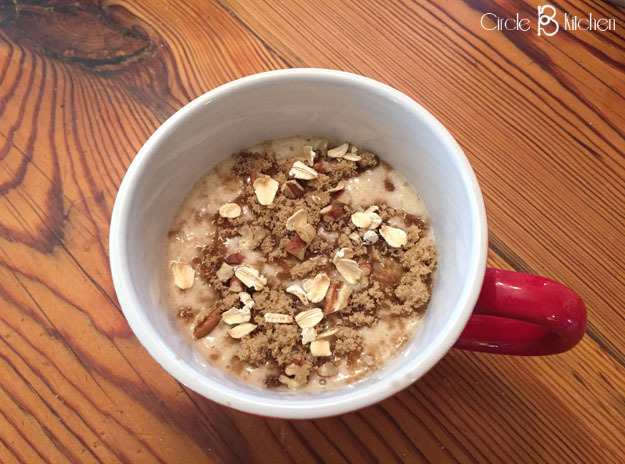 Whisk in the flour until smooth, then whisk in the oats, pecans, raisins, baking powder, salt, cinnamon and nutmeg. cooked and springs back when pressed with a finger. My microwave is 1200 watts and it took exactly 60 seconds. But times will vary in microwave ovens of different powers. So I recommend a conservative approach of microwaving for 45 seconds and then in 15 second bursts until the top looks done. Let stand at least 5 minutes before eating, as the cake will be quite hot. A dollop of yogurt is nice on top of it at breakfast.